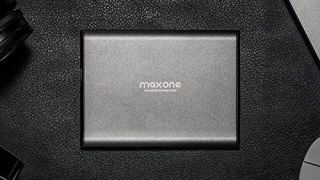 Grab this Maxone external hard drive for less while you can. As a digital artist you'll be all too aware how your computer's memory can fill up faster than you'd like. However if you're waiting until the best Black Friday deals launch later this month to buy an external hard drive for less, readers in the UK will be happy to hear that you can start saving now. This is because today saw the launch of some early UK Amazon Black Friday lightning deals, including money off an aluminium Maxone external hard drive. Popular with both Windows and Mac users thanks to its super fast 5 Gbit/s (625 MB/s) data transfer speeds, the Maxone 2.5" 500GB aluminium portable external hard drive also scores big because you won't need to download additional software to run it. Weighing in at a slender 10mm, its slim design means you'll be able to take large amounts of data with you wherever you go without feeling like you're lugging around a massive physical portfolio. Complete with one year warranty as standard, this external hard drive is sure to sell fast. This Amazon lightning deal runs today from 16.35 to 22.35 UK time, so be sure to pick one up while stocks last. Save 28%: Slim and portable, this plug-and-play Maxone 500GB external hard drive is perfect for Windows and Mac users after massive capacity and super-fast transfer speeds.